The Batman Files is a BIG book–308 13×10 pages!- crammed full of every bit of information known about the Dark Knight Detective. 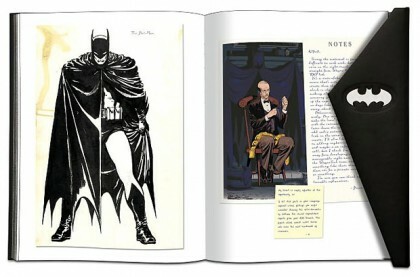 This clever reference book is presented in the form of a scrapbook or journal that details every known aspect of the Caped Crusader as if it had been compiled by Bruce Wayne himself. The author–Matthew Manning in concert with hundreds of artists have done a splendid job. The Batman Files offers hundreds of fun tidbits and delivers the Intel in a way that is both dramatic and personal. This is a must for all Bat-fans. And remember November 1st we will be spotlighting the Batman at the triumphant return of the Heroes Discussion Group.